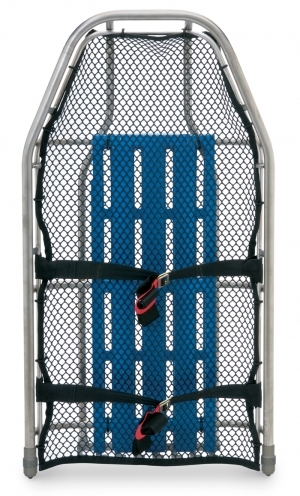 Absolutely the premium choice in basket stretchers whether you are backpacking the litter in or carrying it as standard equipment on a helicopter, the lightweight Titanium Split-Apart Litter nests for optimum storage and packing in, then assembles quickly. 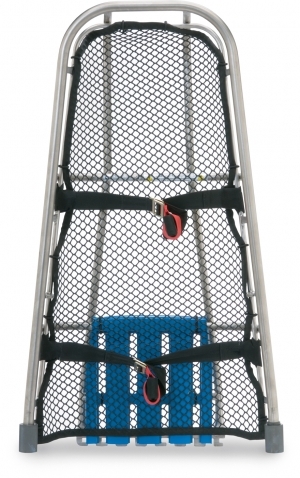 Its nested length is less than 45 in (114 cm), and it comes with four litter straps. Split-Apart Litter Backpack (not shown) is available by special order. The patented StratLoad Attachment Points allow any size carabiner to be used to attach a lifting bridle while keeping both the carabiners and the lifting bridle on the inside of the litter’s top rail. This provides protection from abrasion along cliff faces and walls. The StratLoad feature also prevents cross-gate and side-loading of carabiners and orients the direction of pull along the spine of the carabiner, where it is strongest. StratLoads are 1/4 in (6 mm) thick with a fullround radius on the inside edge, allowing the option of a soft attachment, which is then protected by the top railing.